Strawberry risotto. What a concept! I first learned of the dish during a trip through Italy with my trusty Traveling Companion and a mutual friend. The three of us were staying in Rome and used a tour book to select a restaurant, La Maschera (The Mask), near Rome’s Campo de’ Fiori. For her primo piatto, my friend ordered strawberry risotto. She absolutely loved the dish, as did I when offered a taste. Fast forward a few years, Zia and I are in Rome. Eager to give her this tasty treat, we hopped in a cab and went to La Maschera — which was closed and seemingly had been for quite some time. (Let that be a lesson for you: when returning to a vacation spot, open the purse strings and buy a new tour book.) 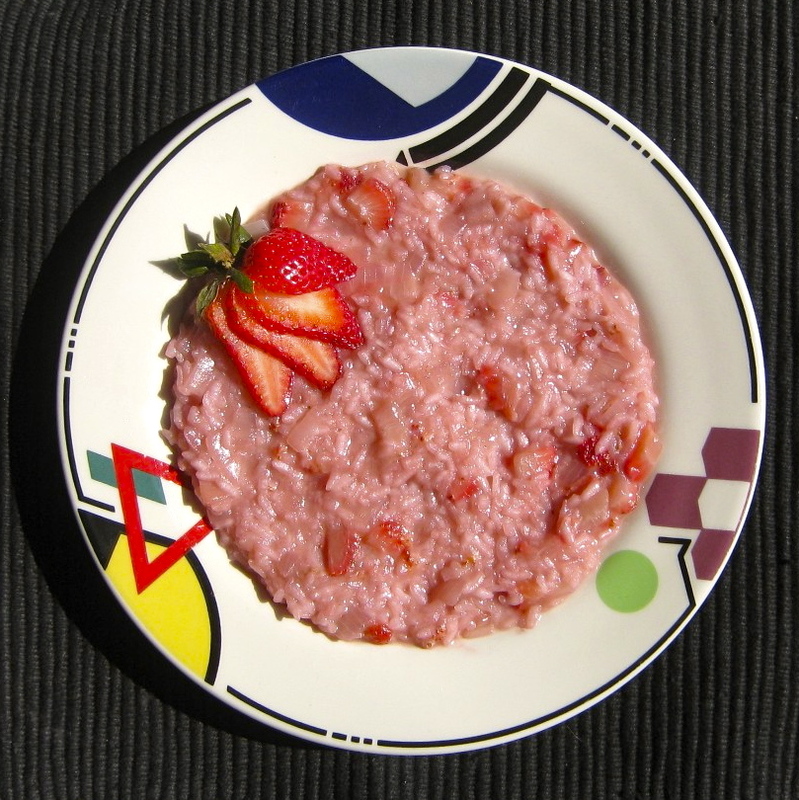 Although we had a lovely dinner nearby, there was no strawberry risotto on the menu and the dish “fell off my radar.” Then, during a sleepless night, I started looking at recipes for strawberry risotto on the web. Pretty much all that I came across shared the same ingredient list as “regular” risotto, save the strawberries, of course. I decided to give it a try and started by making my family’s risotto, substituting strawberries for mushrooms. Next to go were the garlic, cheese, and cream and eventually I settled upon the recipe I’m posting here. First, before sharing the recipe, I think a few things need to be mentioned. This recipe requires that the rice be soaked before cooking. Anyone who has ever made risotto will tell you that this isn’t exactly normal. When I spoke with Zia about writing this recipe, she mentioned that when she was a girl, a family friend, Ida, taught her how to cook risotto and that she always pre-soaked the rice. So, my use of that technique here is something of a salute to Ida. (She, also, insisted that Zia use only Uncle Ben’s when making risotto but that’s where I draw the line. My salute will go no further than pre-soaked arborio rice.) I then experimented with the strawberries. In the beginning, I just couldn’t seem to get a strong enough strawberry flavor. Putting the berries in early only served to have them almost totally disintegrate during the cooking process. I want strawberry pieces in my risotto. Putting them in late resulted in risotto with strawberries in it, almost like breakfast cereal. I want to taste strawberry in every bite. Zia’s memories of Ida’s soaked rice were an inspiration. By soaking the berries in the wine, the strawberry flavor infuses the wine and, as a result, is more readily dispersed throughout the dish. Success! As for which wine to use, I only use white wine in this dish and avoid the sweet varieties, preferring instead a white that is on the dry side. Use a wine that you’d serve to accompany this risotto and you won’t go wrong. Lastly, do not use either cream or cheese with this dish; both will only mask the strawberry’s flavor and aroma. Soak strawberries in white wine and soak rice in 1 cup of stock for 30 minutes before you start cooking. Heat remaining stock in a sauce pan. Adjust heat to keep it hot but not boiling. Add butter to a medium sauce pan over medium heat. Add onion, season lightly with salt & pepper, and sauté until translucent, about 5 – 8 minutes. Add rice, stir, and cook until all the liquid is just about gone. Add another ladle of stock and continue to stir. Repeat the process, adding stock by the ladle, stirring constantly until the liquid is almost gone, and adding another ladle of stock, for no less than 10 minutes. Add the strawberries and wine and continue stirring. When the wine has been absorbed, add a ladle of stock. Continue stirring and adding ladles of stock for another 10 minutes or until rice is cooked to you liking. Season with salt & pepper, stir well, and serve garnished with sliced strawberries. Choosing not to use cream or cheese pretty much limits the possible variations for the dish. You can, however, use champagne in place of the white wine if you’re feeling relatively fancy schmancy that day/evening. Even though this risotto begins with the unorthodox step of pre-soaking the rice, the other “risotto rules” still apply. That is to say, cook atop no more than medium heat, keep the stock hot, and stir the rice constantly. This entry was posted in Pasta/Rice/Soups (Primi Piatti), Vegetarian and tagged Cooking, Food, Italian, Recipes, Rice, Strawberries by ChgoJohn. Bookmark the permalink. Thanks. I definitely agree about the rain-soaked season and wonder what the impact will be upon Michigan’s sour cherry harvest later this month. I gotta have my cherry pie! As for this recipe, if you know how to make risotto, you can make this dish. The only quibble you may have is with the wine selection. I use a drier white because, to my taste, the strawberries are sweet enough. You or — more importantly — your wife may feel differently. Either way, let me know how you like it.